Over the next four days, the Wimco Team inspected more than 20 villas in the Umbrian region, in locations stretching from Orvieto, Terni and Todi, to Umbertide. Spring had just arrived and the fields were green with grain and tobacco. Beautifully large splashes of mimosa accented many of these fields. Wisteria was also in full bloom. One day while approaching a villa in Orvieto, they came across none other than a peacock. The subject of color is cause for pause. Italy is world-renowned as the pinnacle of fashion, and the Umbrian countryside lives up to the Italian standard. The importance of appearance pervades every aspect of life. Roads are spotless and pristine. Whether in the villages or in the more touristed cities, not a trace of litter is evident. Should a driver be pulled over by police (a rare event), they would be met by the most well dressed law enforcement official in the world. It was apparent to the group that Armani probably designs the Italian motorcycle police uniforms. Even the most novice bikers on the side of the road are dressed to the nines in multi-colored spandex. Gas station attendants, too, wear their uniforms with a pride that rivals World Cup soccer teams. The wonderful thing about trying to determine where in Umbria you would choose your villa is that wherever you ultimately decide upon you are seldom more than a 60-minute drive to the most interesting cultural attractions. In Umbertide, where villa Salicotta is located, the towns of Cortona, Gubbio, and Perugia are a 30-minute drive away. Siena is a 60-minute drive and Florence is 90 minutes. Spoleto, Todi, Assisi, and Orvieto are all a 60 - 90 minute drive (American driving time). If you choose to rent a villa in Todi or Orvieto, the opposite applies. You win either way. Friday - Feeling seasoned and looking forward to a new groove, the trio set out for Gubbio to meet with a new contact, Valeria Bosi. Valeria, a "Consulente" for a hotel group headquartered in Perugia, invited the group to inspect a 4-star deluxe hotel, the Relais Ducale. Gubbio is known as "the most beautiful of medieval towns". Gubbio’s streets, monuments, churches, and houses are still perfectly preserved. Gubbio is famous for the annual Corsa de Ceri (Race of the Candles) and the world's tallest Christmas tree. The Race of the Candles, celebrated every May 15, dates back to the 12th century and recognizes the pagan rites of spring and the town’s patron saint. Three teams of men carrying 20’ tall wooden candles on their shoulders run through town as part of this very important festival. The largest Christmas tree is 15-mile cable of colored lights stretching nearly 400 feet up the side of Mt. Ingino. The group parked their car outside the walled city and walked the five minutes to the Relais Ducale. Totally restored in 1997 and located in the heart of Gubbio, the hotel is the annex of the Ducale Palace, where the Duke of Montefalco used to welcome his own guests. The Relais Ducale is a delightful 30-room hotel and makes the perfect accommodation for a one or two night stop on an Umbrian tour. 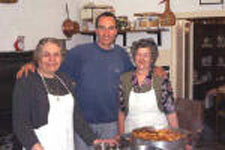 After their inspection of the property, the trio had lunch at the Taverna del Lupo, also owned by the same family. Valeria ordered for Matt, Bethany and Lidy. The group ranked this the best meal while in Umbria - the Taverna del Lupo is a must while in Gubbio and is certainly worth the 30-minute drive from Umbertide. After lunch at the Taverna del Lupo, Valeria Bosi gave the contented trio a tour of Gubbio's shop-lined streets. Matt was after truffles, ceramics and linens. Lidy was on the hunt for tassels, and Bethany was after a nap. What a traveler can expect to find in Umbria are the finest table linens, colorful ceramics and, in Deruta, a town ten minutes south of Perugia, find terra cotta at a tenth of the cost in the States. Matt, a gastronomically motivated traveler, returned home with the finest olive oil imaginable and homemade limoncello from Mimmi’s, as well as table linens and truffles. Even the most rural villages have shops for provisions and household goods, and, while ATMs are not commonly found in rural villages, most towns have a bank to help fill the wallet with copious lire. 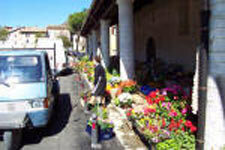 However, shoppers beware: in the European tradition, many shops close in the middle of the day for siesta. Most restaurants do remain open, however, so visitors are welcome to sit back, relax, and enjoy la dolce vita. 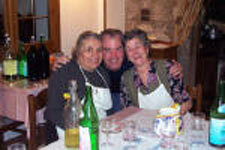 The most wonderful thing about Umbria is the Italians. Many European countries are graced with beautiful vistas, cultural and historical treasures, excellent food and wonderful places to stay. The Italians embraced these three Americans affectionately with kindness, generosity, and infinite amounts of patience. Never once did the Wimco Team encounter any snobbishness or intolerance, in either the city or the countryside, from anyone. The Team had little difficulty communicating with the Italians. With rudimentary Spanish or French skills, communicating in Italy is not as hard as one would believe. Many Italians speak English. More importantly, as befits traveling in most European countries, eye contact, a little humility, some hand gestures and a warm smile will afford you a lot of help. A small translation book wouldn't hurt either!